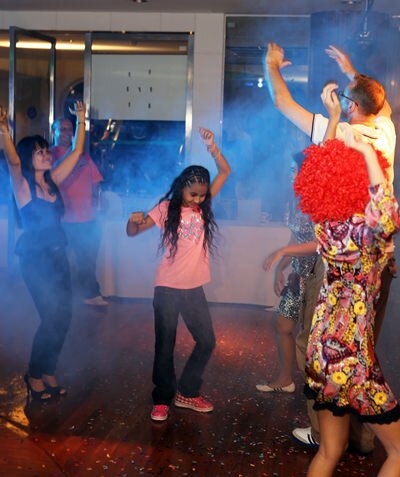 Following on from their highly successful first event, the TFI (Thai Farang Initiative) team returned with another musical themed night on Saturday October 19 at the A One Cruise Hotel. This time the 150 or so party goers were taken back to the sounds of the 70s as the theme for the evening was ‘Disco’. The Boat Music Room at the A-One proved to be an ideal venue with ample seating and a beautifully polished wooden dance floor. A free flow of red & white wine, draught Heineken, bottled San Miguel and soft drinks were served by the ever efficient A-One team accompanied by the eye-catching Heineken and San Miguel promotional girls from 7-10pm, all for the price of 500 baht (400 in advance). Lovely Thai ladies get down and boogie to some 70s Disco. Earl Brown (TFI team member & co-founder of Pattaya Soul Club) got the night started with some classic music replete with flashing disco lights and smoke machine to create that 70’s disco feel. The ‘wheels of steel’ were then handed over to DJ veterans Howard Miller & Dave Dee and then followed by Johnny Diamond from JD Motor Sport Music Radio. Spot prizes were awarded for the best dressed, best dancer and of course a booby prize for the worst dancer! 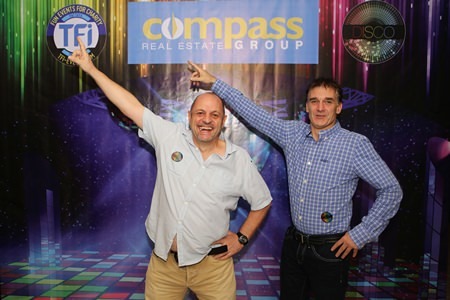 Rob Rowcett and Peter Knight from Compass Real Estate, the sole sponsor for the TFI Disco night, are in the mood for some Saturday Night Fever. 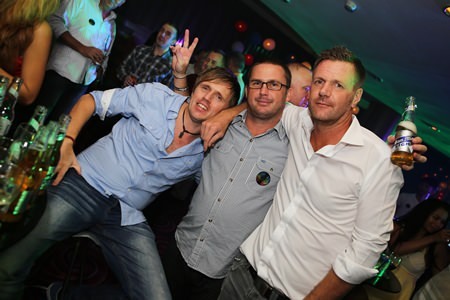 The sole sponsor for this event was Compass Real Estate (www.compasspattaya.com) and its Managing Director Rob Rowcett was present, as were a whole host of familiar faces from the business and networking community along with many new faces, including hotel guests from the A-One. The whole ethos of TFI is to create fun events for charity, with the first event being an 80’s themed music night at the Access Inn, from which 150,000 baht was raised for good causes. These funds went towards providing a new roof for a poor family, school uniforms for local children, rice & food, essentials for families in our community and to help a flood ravaged orphanage in Mae Sot as well as pledging funds for surgery for two children born with facial deformities via Operation Smile. These lads remember the sounds of the 70s. The main beneficiary for the Disco night was nominated by Compass Real Estate who chose Dr Philip Seur and the HEARTT2000 (www. heartt2000.org) which helps people affected by HIV/AIDS. In addition 10,000 baht will be provided to the Hand to Hand foundation for their work in helping kids in Pattaya and 5,000 baht will be donated to the Royal British Legion to help them assist veterans of the military. At 10pm the TFI team were pleased to announce that they would continue the free flow for another hour, delighting guests who were getting great value for money and in turn helping the poor and disadvantaged in and around Pattaya. These events rely upon generous sponsors and cooperation from many sectors, including on this occasion the A-One Cruise Hotel, AKA Traders (who provided the wine), jigsaw2order.com and the assistance of the DJs who gave up their time to help create another fun event. Full details of this fun packed night and forthcoming TFI events can be found on their popular Facebook page: www.facebook.com/funcharityevents or the TFI website: www.TFI-events.com. Even the youngsters enjoyed the Disco music. 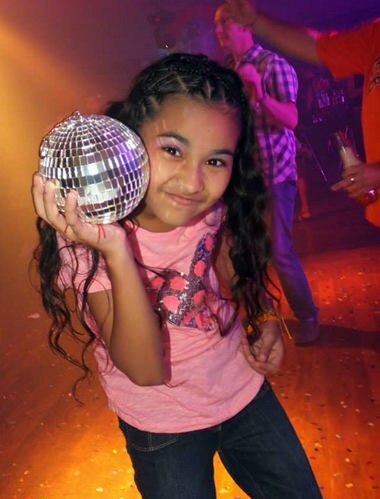 It just wouldn’t be Disco without the ball. The TFI team are joined by one suitably attired Disco enthusiast.